If you’re FSBO-curious and checking out your options for selling your home, I hope this piece has been useful to you. My goal here has been to give you accurate information so you can make the best decisions possible for you and your family. Have you ever sold a home FSBO? How did that go for you? Tell us in a comment below. Your experience can help other people who are trying to decide whether or not to sell their homes themselves. Would the information in this post be helpful to anyone you know? Please send them a link to it. Thank you! And be sure to subscribe to RealEstateDecoded.com if you haven’t already to learn how real estate really works so you can be prepared before you buy or sell a home. 7 Responses to FSBOs vs. Real Estate Agents. Do agents really sell homes for 13% more? And since you think the mobile homes skews the results is Realtors favor, What about new homes. Most builders sell FSBO and the average sale price for new homes is quite a bit higher so that would skew it in favor of FSBO’s. There are other reasons I won’t get into here but I think it is clear you are doing the same thing you are accusing Realtors of doing. Deceiving people by presenting selected facts. A new study came out comparing FSBO to MLS sales and it found FSBOs sell for 5.5% less than MLS sales, http://collateralanalytics.com/saving-real-estate-commissions-at-any-price/. 5.5% seems a lot more reasonable than 13% and I like that they don’t include condos and mobile homes like the NAR studies. But the study does have problems. 1. They call all sales that weren’t listed in the MLS as FSBOs. So if you sell your house to your kid in a sweetheart deal, this study would consider that a FSBO sale. It wouldn’t take too many sweetheart family deals to skew the FSBO numbers down. Or, let’s say you never put a “For Sale” sign in your yard or put an ad in Craigslist, but you called “We Buy Ugly Houses” and sold it, the study would call that a FSBO. The article doesn’t say how they handle foreclosures. I suspect bank foreclosures were also considered to be FSBOs in this study. 2. FSBOs that were listed in the MLS are not called FSBOs. In many places a seller can pay an agent, say, $250 to list the home in the local MLS but that is the only service the agent provides. Thye are essentially FSBOs but in this study, those would NOT be called FSBOs. 3. They use average instead of median home prices. Averages can be easily skew by a small number of outliers. Medians can’t. 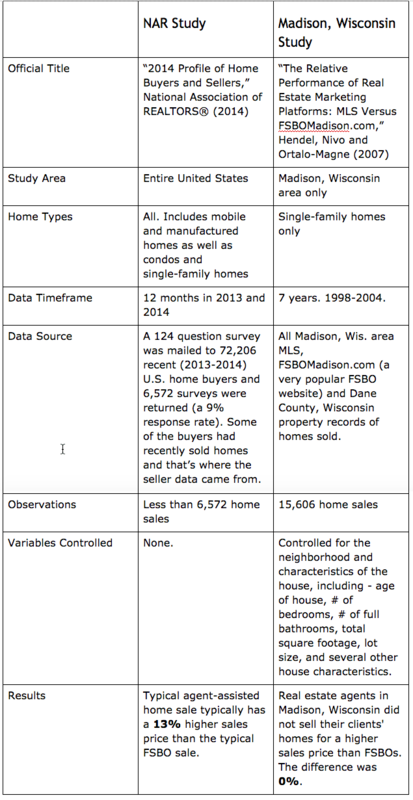 I’m sure the differences between FSBOs and MLS would be smaller looking at median prices. 4. There could be some weird artifact in their AVM algo that skews the numbers against FSBOs. It’s also weird that the average price of FSBOs in their study was significantly HIGHER than MLS sales. It may be that their AVM is less accurate with more expensive homes and that its error systematically tend to be on the high side. Anyway, there’s something weird going on with the FSBOs being MORE expensive than MLS sales. Nevertheless, I wouldn’t be at all surprised if agents sold homes for more than FSBOs but 5.5% still seems a little high to me. Wow! That’s a great way to explain it! I’m stealing that. Thanks! I think this myth got around because real estate agents and brokers are able to sell really well. Their job is primarily to buy and sell homes. It would be a great skill to have because you could sell homes and make a good amount of money really easily. Thanks for reading this far! Feel free to jump in and make a comment.